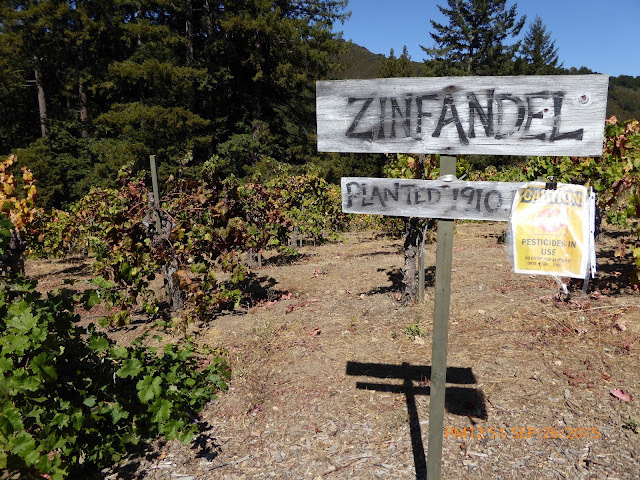 The first two days of our wine tasting trip to the Santa Cruz mountains, focused on the mountain wineries. The plans were made months in advance, and scheduled with a van operator. Typically, Sunday and Monday are an opportunity to explore some smaller wineries where reservations are not required. This time around, it was a little different, as one of the members in our group has a son that works for Bonny Doon. 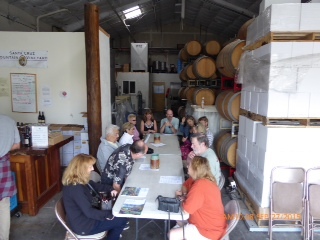 He scheduled three tastings for us, unfortunately, Bonny Doon had a Club Member event going on that day, so only a tour of their crush facility was available. We left our hotel in Monterey and about 45 minutes later arrived in Santa Cruz. Be careful of your speed on this drive, as the highway patrol were there, and caught one of our drivers going a little too fast. Not fun to start your wine tasting with a speeding ticket. Our first stop was at the Santa Cruz Mountain Winery. The tasting room is located within a collective of micro-boutique wineries and breweries, as well as restaurants. An urban renewal project turned this former warehouse space into a trendy destination. The individual wineries are in close proximity on the Westside of Santa Cruz on Ingalls Street, Swift Street, and the Old Sash Mill. The Santa Cruz Mountain tasting room is also the winery. A long table was set up, in anticipation of our arrival. The winery has two labels: Santa Cruz Mountain Vineyard and Quinta Cruz Wines. Santa Cruz Mountain Vineyards has been around since 1975, and is known for their Pinot Noir, but they make numerous other whites and Reds. The Quinta Cruz label was added in 2008, with a focus on Spanish and Portuguese grape varieties. We tasted somewhere in the neighborhood of 15 different wines. I purchased the 2012 Branciforte Creek Pinot Noir and the 2008 Rabelo, which was a nice expression of an LBV style Port. Our next stop was right next door at Equinox/Bartolo Winery. The first thing you notice, as you walk into the tasting room, is the rows of riddling racks in the warehouse area. 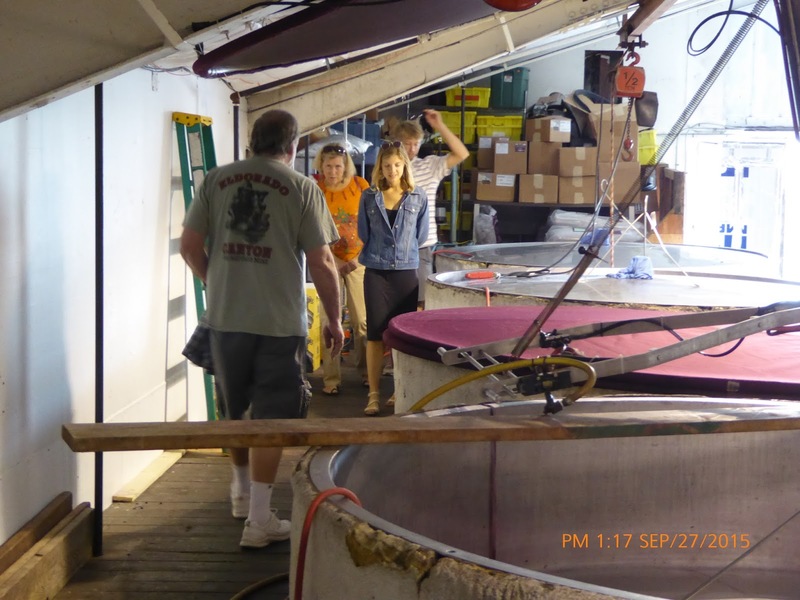 It is not often that you see traditional sparkling wine production methods being used in a small, new world winery. But, here they were. Obviously, the focus was on their sparkling wine production, and for good reason…they make nice sparkling wine. The wines are aged “en tirage” anywhere from three to eleven years, yielding deliciously yeasty sparkling wines. I picked up a 2001 Brut, made with a blend of Chardonnay and Pinot Noir. Their second label is Bartolo. Here, the focus is on all different types of grape varieties, from obscure Fiano to Cabernet and Grenache. One of my current favorites is Petit Verdot, and I picked up a bottle of the 2009, which also has about 13% Merlot in it. The next stop was at the Bonny Doon production facility, which was just around the corner. By this time, it was about 2:00 in the afternoon, and many of us were starving. While some went to Bonny Doon, to check at the crush and fermentation tanks, the rest of us went to lunch at the West End Tap and Kitchen. Duck Fat popcorn, flatbreads and freshly made Calamari made for a great lunch break, along with the house sampler of craft brews. After a quick stop at the downtown tasting room of MJA (we visited their mountain tasting room the day before), to pick up some coffee beans and balsamic, we headed back towards Monterey, and stopped in the little town of Soquel to do some tasting at Bargetto Winery. Bargetto is one of the older wineries, dating back to 1918 (just in time for prohibition). The tasting room and gift shop is located on Soquel Creek, in a quiet neighborhood. 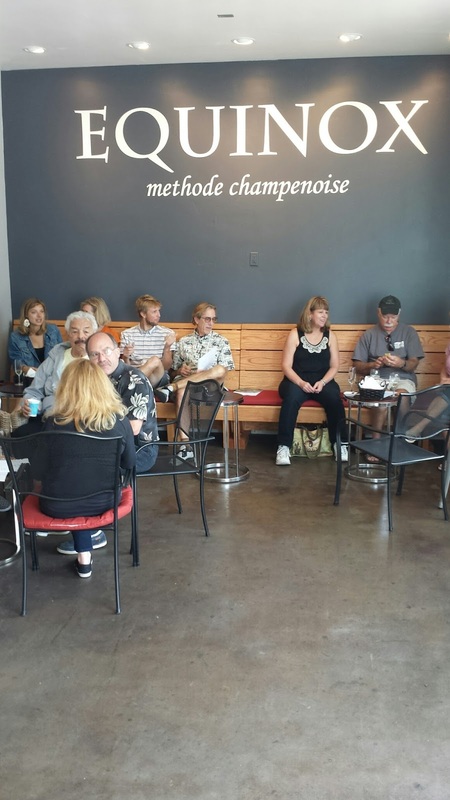 A large bar was set up for our private tasting, but by this time, our group had dwindled down to about eight people. The tastings included Pinot Noir to Syrah, along with their La Vita blends. We had also heard about their fruit wines, and with some prompting, were able to try them too. I am not a big fan of fruit wines, but certain members of our group really enjoyed them. I ended up purchasing the 2010 La Vita (a blend of Dolcetto, Refresco, and Nebbiolo). We rushed back to Monterey after our tastings, to make sure we made our dinner reservation in time at Andre's Bouchee, in Carmel. As we walked in the door, the power went out on the entire block. After waiting a bit, to see if it would come back on, the decision was made to find another location for dinner. We still want to go back, and try out this well rated restaurant. A couple phone calls later, we walked two blocks to Casanova’s (our favorite dinner spot from three years ago). They got a group of ten in with no problem. Monday was a causal day, and we split from the group and chose to drive to the Carmel Mission. 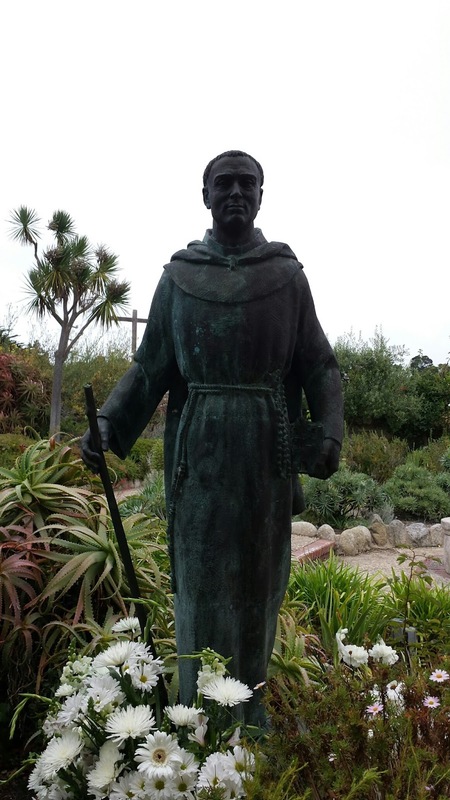 Junipero Serra was sainted the week before, by the Pope, so we wanted to see the spot where he was buried. This peaceful mission is located in the middle of a residential area, and is very historic, and worth the stop. We then chose to take the long way home, and drive down Highway 1, along the coast, cutting inland at Paso Robles. We hooked up with some members of our group in Edna Valley, for a quick tasting at Claiborne& Churchill. Of course, we had to pick up some of their dry Riesling and Gewurtztraminer. My thoughts on the four days? If you plan on visiting the Santa Cruz area for wine tasting, it might be best to stay in Santa Cruz, and save yourself some time. We chose to stay in Monterey because we enjoy the restaurants in the area. I am sure that Santa Cruz has its’ share of fine dining. When visiting, plan your wine tasting stops. The wineries are spread out all over the mountains, and while they look close on a map, they can be far apart in drive time (the exception would be areas like the Ingalls Warehouse area, where you can find a bunch of wine tasting rooms in one location). As usual, my hope is that this will inspire you to explore the area, and enjoy the food and wine of the central coast.